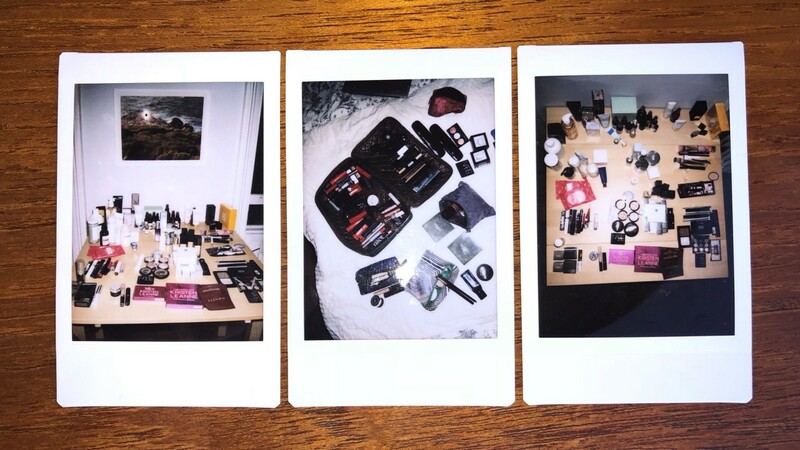 As Coveteur’s beauty director, I bring home A LOT of beauty products to test. Every week is like a Sephora shopping spree landed in my apartment. There are bags of skin care, makeup, and hair care by the front door, next to my desk, in the bathroom, and even sitting in the middle of the room. (And that’s even after my picky selection from the mountain of samples we receive at the office.) To be honest, I tried counting the number of beauty products in my apartment, and I couldn’t get through them in time to write this. Of course, I don’t feel sad about having an endless stream of fun, happy stuff to play with—I’ve discovered some absolute winners that have changed my hair and skin for the best—but the truth is, over the years it has *piled up*, and in a 350-square-foot studio, it was feeling overwhelming and not so fun and happy. We cleared my papers off my desk and lined up all—and I mean ALL—the foundations, primers, blushes, serums, cleansers, mascaras, lipsticks, etc., in groups. This way I had to unearth everything from the recesses of my cabinets and makeup bags to make decisions with some context about the rest of my collection. This is a major pillar of Marie Kondo’s KonMari method. 1. Expiration Date. The date will be printed on the bottom of the bottle, on the crimp of a tube, or, if that sucker is still in the box, on the back of it. This is especially important for something like sunscreen that can be totally ineffective and pointless once it starts to head south. 2. Period After Opening (PFA) Logo. Look for an image of a little open jar with a number printed inside. The numbers tell you how many months (e.g., 12M) it will remain good after you’ve cracked it open and exposed it to air, fingers, etc. If you can’t remember exactly when it was opened, think about what was going on the first time you used it: Which apartment were you living in, for which occasion did you buy it, etc? You can also try the cosmetics calculator. 3. A Funky Smell. When in question, do the sniff test. This is especially important for mascaras (which are designed to be tossed after three months, by the way! ), as they tend to turn the fastest and have the worst consequences (hello, eye infections) if they aren’t fresh. If it smells kind of sour or old and damp, say goodbye. Once everything is in groups, the purging goes fast. For example, if I have a bunch of highlighters to test, I can swatch each on my cheek or hand and immediately compare. Or if I see the serum I was jazzed about sitting next to the one that was supposed to be great but didn’t really do anything for me, I know which one to toss. You’ll definitely want some non-harsh cleansers at the ready so you can clean your slate and keep on your testing streak. I set myself up with the aforementioned Tatcha The Deep Cleanse at my sink and Ole Henriksen Truth on the Glow Cleansing Cloths at my desk. By the end I realized that the big trick to getting rid of stuff is just having a person to help you. 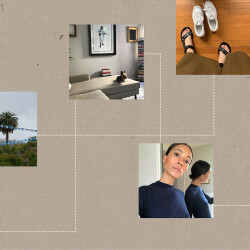 With Socci next to me, I had to be practical and honest with both myself and someone patiently watching me about whether each item was really worth taking up physical and mental space in my life. Staring with uncertainty for more than 10 seconds at a half-used body wash feels pretty silly pretty fast. Having someone else there forces you to see your odd habits with fresh eyes. As for how I go about organizing all of it? Well, that’s for a different post and a whole other weekend. Wish me luck!